Despite the progress, pundits and leading Democrats still complain. Atwo-hour White House meeting last Friday between President Trump and Kim Yong-chol, the chief negotiator for North Korean leader Kim Jong-un, apparently cleared the decks for the next phase in the US attempt to convince Kim to give up his nuclear weapons in return for relief from economic sanctions and a new relationship with the United States. The other US officials at the session were Secretary of State Mike Pompeo and Stephen Beigun, the former Ford executive who is now serving as Pompeo’s Special Representative for North Korean Policy. After the meeting, which Trump called “incredible,” the president announced that a site had been chosen for his next summit with Kim, to take place “probably at the end of February.” The next site is widely expected to be Vietnam, which also fought a long, bitter war with the United States and will soon host Kim for a state visit to Hanoi. In fact, despite the indifference of the US media and Democratic Party hostility to the talks, it appears that US and North Korean negotiators have made significant progress in moving the process forward in recent weeks. The divide has been primarily over US demands that North Korea show it is taking irrevocable steps to phase out its nuclear program before any economic sanctions are lifted, and the North’s long-stated desire for a formal declaration by the United States and the two Koreas ending the Korean War. 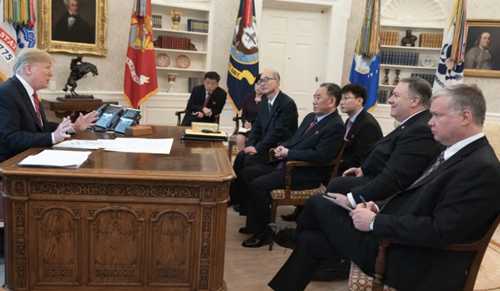 The most telling sign of that progress came in an official photograph of the White House meeting—complete with a new letter from Chairman Kim sitting on the desk—that was distributed by Trump’s communications team. That is already happening. On Saturday, Beigun flew to Sweden to begin the first official diplomatic talks since the Trump-Kim meeting in Singapore last June. On Monday, he met with his counterpart in Pyongyang, Choe Son-hui, North Korea’s vice foreign minister and a well-known figure to US diplomats. Lee Do-hoon, a South Korean negotiator dispatched by President Moon Jae-in, also took part in the talks, which were described as “constructive” by Sweden’s foreign ministry. “With the possibility for a few more rounds of working-level exchanges before the next summit, it is now much more likely that the two leaders [Kim and Trump] will be able to agree to a much more in-depth series of commitments in Vietnam,” O’Carroll said in an interview. In 1989, Ahn said, Pak was the lead interpreter for North Korea during a World Youth Festival in Pyongyang that became famous in South Korea when a university student, Im Su-kyong, crossed the DMZ to attend (she met Kim Il-sung, Kim Jong-un’s grandfather) and was arrested upon her return to Seoul. Years later, Im was elected to the South Korean National Assembly. Her lawyer at the time, the activist Im Jong-seok, was also arrested, but he went on to serve until a few weeks ago as the chief of staff to President Moon. More recently, when Ahn was negotiating with the governments of North and South Korea and the UN Command in Korea for the first women’s crossing of the DMZ in 2015, she met frequently with Pak Chol in New York. “I credit him as the key North Korean diplomat who advocated for the peace walk,” she said. Pak’s presence in Washington with Kim Yong-chol, she added, shows “he has the ear” of Kim Jong-un. “It heartens me to see that his experience and expertise is so highly regarded and that he can use all of that to help end the war and help transform North Korea,” she said. During their brief stay in Washington, however, Pak and his delegation were apparently under strict orders not to make any public comments. Many South Korean reporters and a few US journalists staked out the Dupont Circle Hotel where Kim Yong-chol and his retinue stayed, and where he met briefly on Friday with Pompeo. But reporters were unable to get any quotes from him for their stories. “It’s so hard to spot North Korean delegations at their hotel!” one frustrated Korean reporter posted on Facebook, along with several photographs. “They’ve been using (garbage) back door of the hotel to avoid media. GIVE UP NUKE & USE FRONT DOOR MAN!” Earlier, a few enterprising Korean reporters managed to capture the North Koreans’ arrival at Dulles Airport in Virginia and catch Kim riding on one of those uncomfortable and annoying buses that transport tired travelers to the main terminal. For the US media, Kim Yong-chol’s visit—the first time since 1998 that a North Korean official had flown directly to Washington—was overshadowed by the frenzy over BuzzFeed’s story that Trump had advised lawyer Michael Cohen to lie to Congress over a potential business deal in Moscow. As a result, there was little incentive to report in any depth on the US–North Korean talks. Instead, the networks performed their usual role by using the White House meeting as another opportunity to hammer Trump and disparage a Korea peace process they’ve never liked. Within minutes of the White House talks, Victor Cha, the former Bush official at the Center for Strategic and International Studies (CSIS), was on Andrea Mitchell’s show on MSNBC playing down the chances for success and suggesting “a little bit of desperation on the president’s part.” An hour later on the same network, Cha’s colleague at CSIS, former CIA analyst Sue Mi Terry, was saying much the same to host Katy Tur (the segment showed how little Tur, who covered the Singapore summit for NBC, has learned; when Terry told her that Kim Jong-un is seeking an end to the war, Tur foolishly asked “didn’t they already declare” that?). Unfortunately, the charge that Kim Jong-un is “gaming” Trump and the United States has also become a litany for many Democrats as they use their new powers in the House to go after Trump. On CNN on Friday, for example, former Obama strategist David Axelrod joined a smug and clueless Brooke Baldwin in an inane conversation about whether Kim Jong-un is “totally playing this president.” Both displayed their utter contempt for the Korea reconciliation process by dismissing Friday’s White House meeting as mere “theater.” Like so many US commentators, they completely discounted the fact that South Korea’s Moon and his government are playing a critical role as a mediator between the United States and the North in hopes of finding a permanent peace. Worse, in a vivid example of how little some Democrats care about South Korea’s deep interest in reconciliation, Senator Chris Murphy of Connecticut issued a scathing tweet on Friday about what he considers the folly of the Trump-Kim summit. While anyone knowledgeable about Korea is aware of Kim’s sordid human-rights record, Murphy’s blast overlooked the fact that Moon, whose parents fled the North in 1950, has also embraced Kim as part of the inter-Korean peace process and last September signed a sweeping demilitarization agreement with the North that led to unprecedented changes on the Korean border. And Murphy completely ignored the North’s suspension of its nuclear and missile tests over a year ago. A few Democrats are taking the high road. Hours after Senator Murphy’s outburst, Representative Ro Khanna of California tweeted his support for the peace process. “Glad to see new talks with North Korea,” he said. “Diplomacy is necessary to end this nearly 70-year conflict. An attack on nuclear-armed North Korea is simply not an option.” Many of his fellow lawmakers, however, are hostile to the talks and, according to a House aide who works on Korea issues, will be pushing Murphy’s more confrontational line as the 2020 election approaches. There was one voice countering Washington’s armchair generals on MSNBC and CNN, however, and it came from an unlikely source: Vincent Brooks, a retired US Army four-star general who, until recently, commanded US and UN forces in South Korea. On Friday night, Brooks appeared on PBS NewsHour in his first interview since his retirement. He gave a ringing endorsement to the Korea peace talks and a second summit between Trump and Kim. Asked about the criticism from Senator Murphy and others that the suspension of US–South Korean military exercises has “degraded” US military readiness, General Brooks was unequivocal. “The readiness does get degraded,” he told interviewer Nick Schifrin. “But let’s put that in context. So there has to be room for diplomatic maneuvering, diplomatic action to occur. And if creating leverage or traction comes from these adjustments to the exercises, then that’s a risk that has to be consciously taken.” The entire interview is worth watching as an antidote to the ill-informed Washington consensus on Korea. The establishment elite, he said, includes “media pundits, senior scholars, and anti-Trump reporters who accept the received wisdom or gospel of ‘thou shalt not talk with North Korea’ and other truisms.” But “people who live or have lived in Asia, military folks, Asian officials, and people who do a lot of field work in Asia, seem more willing to question the received wisdom and try something new,” he said. But most of the US media are content with their establishment views and rarely seek out people holding contrary opinions on Korea. That, of course, is the job of reporters, but in this day and age, the media themselves—led by NBC and its cable twin, MSNBC—seem content to be official voices for war and confrontation.